It’s a little after 8 a.m., June 13, 1944, and Lt. William C. Frodsham, Jr. is in the fight of his life. Eight days earlier, he and his platoon had waded ashore on Dog Green Beach along with thousands of other determined G.I.s. during the famous D-Day invasion. Then, they had slogged 12 miles into the Normandy countryside under withering enemy fire. Now, Frodsham and his men are pinned down and outnumbered among the hedgerows, waging a brave and bloody battle against equally determined German forces. It’s an action-packed start to this excellent first-person narrative about one man’s harrowing — and sometimes humorous — experiences in World War II. Well-told in an almost cinematic style, this tale draws the reader immediately back to that unforgettable time when America — and its young men and women — were thrown into a global conflict whose outcome was perilously uncertain. In large part, however, the book, which is largely based on Frodsham’s personal diary, is full of anecdotes and fascinating stories that will surely appeal to anyone who has spent time in the military. Indeed, much of it rivals Neil Simon’s Biloxi Blues in its ability to enthrall the reader. Flash back to December 7, 1941. Frodsham has kissed his girl goodbye, along with his family, and shipped off to Fort Dix, NJ — the first of several Army posts where he is taught to be a soldier. 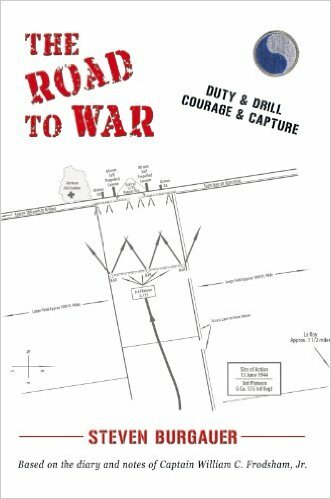 What follows is a highly entertaining account of what it was like to be in the U.S. Army back in the early days of the war. Frodsham excels in every posting, and is soon on his way to OCS — Officer Candidate School. But his journey is not without its share of off-base adventures — like the 24-hour AWOL Christmas trip to a friend’s home, and the brief but victorious alley confrontation in which he and a ranking middleweight sergeant dispatch four paratroopers intent on getting them kicked out of OCS. Time passes and Frodsham seeks — and wins — the hand of his beloved Connie, and they are married in a full-blown regimental ceremony on May 22, 1943 at Fort Leonard Wood in rural Missouri. Their precious time together is brief, however, as he ships out to England in October aboard the newly refitted SS Mauritania. The five-day voyage is uneventful — except for two exciting days wallowing through 50-foot ocean swells — and he lands at Liverpool along with thousands of his shipmates. Endless days of drills and preparation for the Normandy invasion are interspersed with fascinating stories of Frodsham’s fraternization with the Brits — and inspiring insights into how this remarkable island nation not only survived the Blitzkriegs, but found humor and hard-won conviviality in its neighborhood pubs each night. Then, D-day arrives, and it finds Frodsham floating with his men just off the Normandy coast. It’s a hellish scene that confronts them as they wade ashore. Body parts litter the beach, but Frodsham and his platoon forge ahead, intent on their mission to make it to the village of Isigny and hold it until relieved. Finally, they come upon a German force larger than them, and, after a furious firefight, Frodsham orders his men to lay down their arms. They become prisoners of war, and the remaining pages detail the hardships, pain, and debilitating slow starvation inflicted upon the troops. Still, Frodsham and his fellow detainees find opportunity for gaiety even in a Gulag. A theatre group sprouts up, and even a camp newspaper, The Oflag 64 Item. Still, starvation is a constant companion. Frodsham, like most of his fellow POWs, loses more than 60 pounds while in captivity. I won’t reveal the book’s surprising and satisfying end. Suffice to say, celebration of the War’s final actions is sweet for Frodsham — who at many times during a forced wintertime march from Poland by his captors, fleeing the advance of Russian liberators, lay huddled against cattle for simple warmth during the long, frozen nights. This memoir is a saga of celebration and hardship, heroism and tragedy, set against the sweeping backdrop of the twentieth century’s most important worldwide conflict. Yet it carries with it a tone and craftsmanship at once imminently readable and startlingly personal. The author has written a masterpiece of first-person narrative gleaned purely from Frodsham’s meticulous diary and equally exhaustive research that often puts the reader squarely in the middle of war-torn France and into the very hearts and souls of the valiant men and women who secured the peace we now enjoy. Five-plus unequivocal stars to The Road to War. It’s an extraordinary read that everyone should enjoy.